Lambert and Alice Harris's daughter Grace (always known as Ivy) was born on 1st August 1897 at their home at 8 Boxworth Grove Barnsbury. 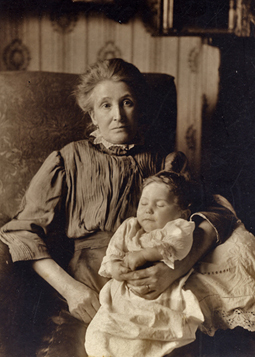 Ivy is picturered with her mother Alice at the local photographer Bertolle & Sons of Caledonian Road. The map below shows Boxworth Grove off Richmond road. Bertolle's photo studio was located on the corner of Richmond & Caledonian Roads at no. 268 (coloured blue) opposite the Duke of Richmond Pub now named The Tarmon. The Street Directory dated 1899 shows the section of Caledonian Road between the junctions of Richnond Road and Copenhagen Street. 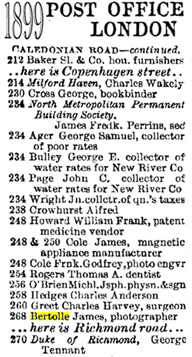 Bertolle's operated from this address from 1885 to 1947. Note the interesting Professions listed.